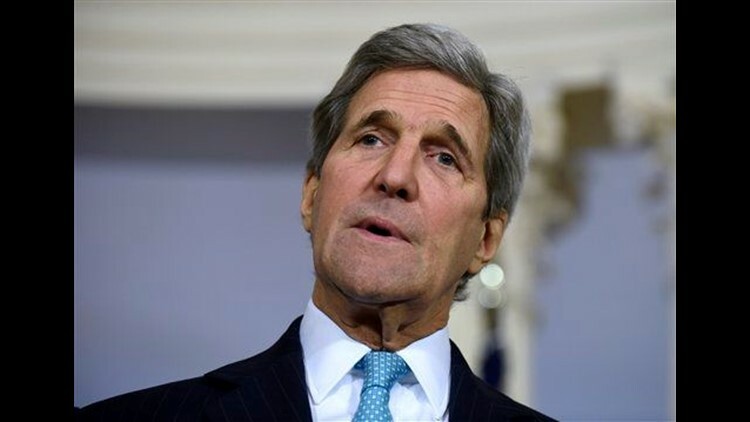 WASHINGTON (AP) — Secretary of State John Kerry on Thursday determined that the Islamic State group is committing genocide against Christians and other minorities in Iraq and Syria, as he acted to meet a congressional deadline. Kerry's finding does not obligate the United States to take additional action against IS militants and does not prejudge any prosecution against its members. A day after the State Department said Kerry would miss the deadline, Kerry said he had completed his review and determined that Christians, Yazidis and Shiite groups are victims of genocide and crimes against humanity by IS militants. The House earlier this week passed a nonbinding resolution by a 393-0 vote condemning IS atrocities as genocide. "In my judgment Daesh is responsible for genocide against groups in territory under its control" Kerry said, using the Arabic acronym for the Islamic State group. He outlined a litany of atrocities that he said the militants had committed against people and religious sites, as well as threats. "Daesh is genocidal by self-acclimation, by ideology and by practice." Saying that he was "neither judge nor prosecutor nor jury," Kerry added that any potential criminal charges against the extremists must result from an independent international investigation. Kerry said the U.S. would continue to support efforts to collect evidence and document atrocities. While his determination does not carry such weight, Kerry said he hoped that groups he cited as being victimized would take some comfort in the fact that the "the United States recognizes and confirms the despicable nature of the crimes committed against them." Lawmakers and others who have advocated for the finding had sharply criticized the State Department's initial disclosure Wednesday that deadline would be missed. U.S. officials said Kerry concluded his review just hours after that announcement and that the criticism had not affected his decision. On Thursday, Rep. Jeff Fortenberry, the author of the House bill, commended Kerry's decision. "The United States has now spoken with clarity and moral authority," Fortenberry, R-Neb., said in a statement. "I sincerely hope that the genocide designation will raise international consciousness, end the scandal of silence, and create the preconditions for the protection and reintegration of these ancient faith communities into their ancestral homelands. Christians, Yezidis, and others remain an essential part of the Middle East's rich tapestry of religious and ethnic diversity." Kerry's determination marks only the second time a U.S. administration has declared that a genocide was being committed during an ongoing conflict. The first was in 2004, when then-Secretary of State Colin Powell determined that atrocities in Sudan's Darfur region constituted genocide. Powell reached that determination amid much lobbying from human rights groups, but only after State Department lawyers advised him that it would not — contrary to legal advice offered to previous administrations — obligate the United States to act to stop it. In that case, the lawyers decided that the 1948 U.N. Convention against genocide did not require countries to prevent genocide from taking place outside their territory. Powell instead called for the U.N. Security Council to appoint a commission to investigate and take appropriate legal action if it agreed with the genocide determination. Kerry's determination followed a similar finding by department lawyers. In making his decision, Kerry weighed whether the militants' targeting of Christians and other minorities meets the definition of genocide, according to the U.N. Convention: "acts committed with intent to destroy, in whole or in part, a national, ethnic, racial or religious group." A recent report from the Knights of Columbus and In Defense of Christians identified by name more than 1,100 Christians who, the groups said, said had been killed by IS. The report detailed numerous instances of people kidnapped, raped, sold into slavery and driven from their homes, along with the destruction of churches.